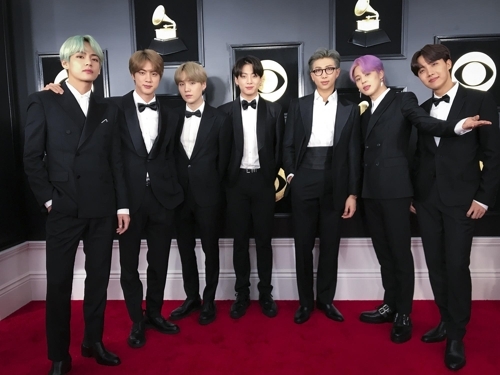 The K-pop boy band sensation BTS called their appearance at a red carpet event for the 61st Grammy Awards Sunday, the first by Korean artists, a moment when their dreams came true. "I can [see] so many artists. It's exciting," BTS member Jin said in a brief interview with the Grammys on the red carpet. "(It's a) dream come true," member J-Hope noted. Suga also expressed his thrill, saying, "I cannot believe it," as the seven members appeared for the ceremony on Sunday at the Staples Center in Los Angeles, clad in sleek black tailored suits.